Pope John Paul II is set to become a saint in a special ceremony to be held at the Vatican on Sunday April 27. The canonisation will be the quickest in modern history coming just 9 years after his death in 2005. Pope John XXIII is also set to be granted sainthood during the ceremony and just to put into perspective how quickly John Paul II has been recognised, it has been 51 years since John XXIII passed away. 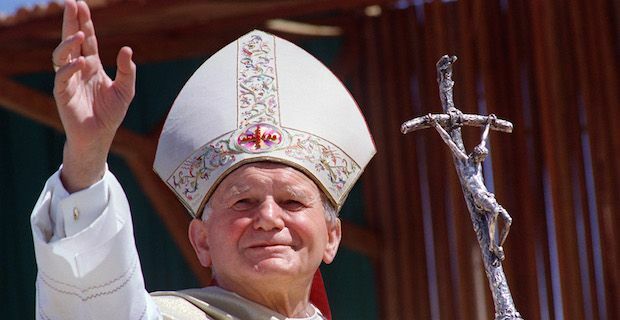 John Paul II's postulator, Monsignor Slavomir Oder, believed he was destined for sainthood from day one as he told Vatican Radio "John Paul's profound mysticism encouraged him to personally live out the mystery of God in his own life". Oder went on to explain that the main thing that makes a saint is that a person is a true "Man of God" and he said that this perfectly described Pope John Paul II. The Vatican announced that 19 heads of states along with 24 Prime Ministers will be in attendance at the mass. The canonisation will be the latest in a long line of recognition for Pope John Paul II who won Time magazine’s Person of the Year in 1994. He was one of the most loved popes in history and he had a great knack of connecting with the people he met.